So goes the tall tale about Omaha Road Bridge Number 15, built in 1915 by the Chicago, St. Paul, Minneapolis and Omaha Railway. It is unusually shaped, because the swing span is asymmetrical. 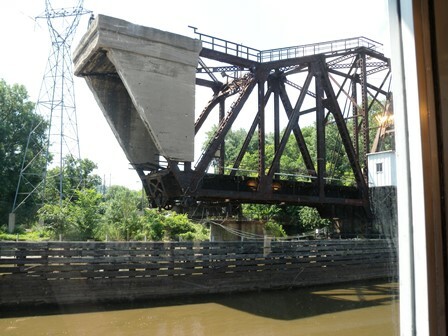 Legends aside, the reason for the “bobtail” configuration of the bridge is that the section of the river deep enough for navigation at that point is not wide enough to accommodate a full-sized swing bridge. The concrete counterweight is necessary to keep both ends of the bridge in balance over the center pier, which is near the right descending bank. Ah, the fun of tall tales, legends, and myths. And every inch of the Mississippi River is filled with them; stories of Huckleberry Finn on a raft and French fur trappers in canoes; Spanish conquerors seeking gold and scoundrels running scams at every paddle-wheeler stop. 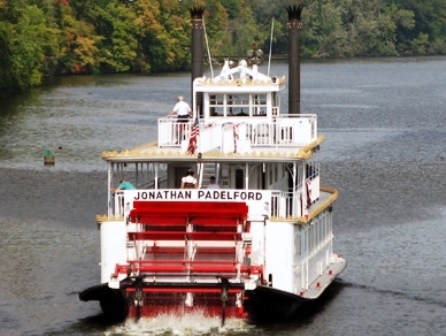 River travel was hazardous, back in the days; there were sand bars and snags to contend with; and as our story-tellers told the tales today, many steamboat races became so fierce the boat simply exploded and burned. “Pile in the wood,” the captain would say, weighting down the steam release valve to increase the pressure, as wagers were laid on which boat would arrive first; river etiquette be damned. And then, ka-boom. In the forty years up to 1850, there were some 4,000 fatalities on the river due to boiler explosions and some 500 vessels wrecked. But it wasn’t all due to hot-headed racing. Early boilers were weak and vessels were not inspected, or insured. We know that Mark Twain’s brother was killed in a boiler explosion in 1858; the loss of 1,600 lives due to boiler explosions on the Sultana near Memphis in 1865 make it the worst maritime disaster in US history. No racing today; we cruised gently upstream, passing under bridge after bridge, waving at people on the sandy banks, spying eagles and egrets, barges and bluffs; our story-tellers gave us a few facts on the barge traffic as we passed a grain elevator; a few more about the geology of the land, and the river’s depth. 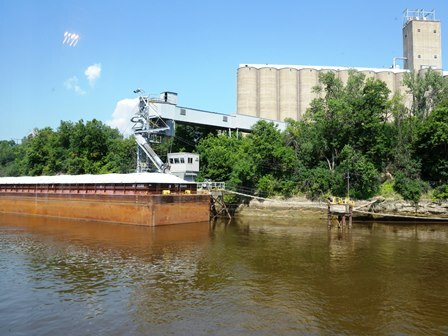 It’s not just grain that barges through Saint Paul, I learned; the 10 million tons that go through in a year includes salt, fertilizer, wood fiber, feed additives, pig iron, scrap iron, and petroleum coke. Coke goes to downriver power plants; scrap metal to steel mills in Arkansas, Tennessee, and Alabama. 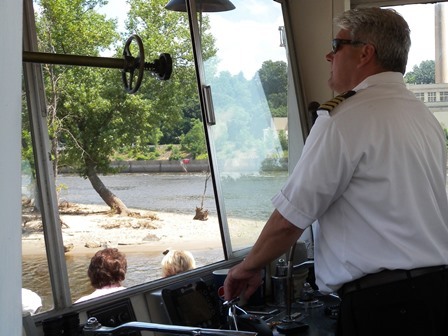 I climbed the steps to the bridge, to ask Captain Mark a question or two, watching the screens he monitored and noting the buoys that marked the channel. 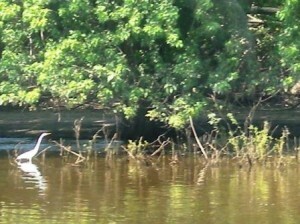 The river was calm, but very muddy; recent rains, he explained. Yes, people eat the fish they catch in this muddy water, but usually they let them swim in a bucket of clean water for a few days first. 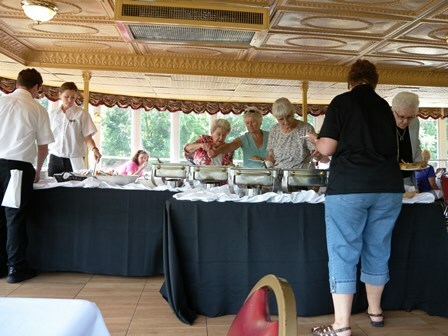 Lunch was announced at 12; the bus-load of tourists who made up the bulk of the passenger list got in line for turkey and dressing and mashed potatoes and gravy, a feast and a bit unusual, I thought, for a hot July lunch. Nevertheless, it was delicious (I guess we all had farmers appetites, I went back for seconds myself), and by the time the dishes were cleared we’d reached the lock. I headed out to watch the gates disappear in our water elevator; my new friend Tina came out too, but her husband stayed inside, sipping on his coffee. “It’s too claustrophobic,” he apologized. 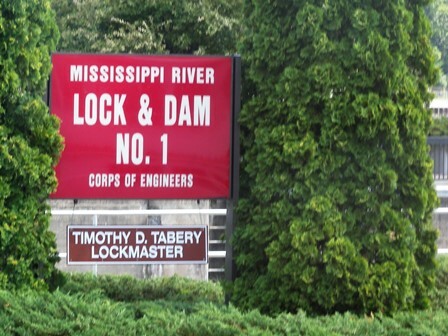 “I don’t want to see.” I was thrilled to be passing through the very first lock on the entire Mississippi navigational system; that turned out to be not exactly a myth, though it is a misnomer. It is named #1 but is actually the third; the Upper and Lower St Anthony Falls Locks are a bit further upstream in Minneapolis. They were built in the 50’s and 60’s, however; #1 was built in 1917; and they can’t accommodate the heavy-duty barges that go through #1. 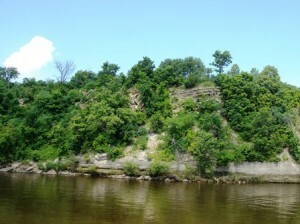 Ford Motor Company, which operated a hydroelectric power station to feed electricity to its assembly plant on the east side of the river, did own the dam portion of #1; Ford sold to Brookfield Power Company in 2007, after the plant closed. The lock is operated by the Saint Paul district of the US Army Corps of Engineers’ Mississippi Valley Division. 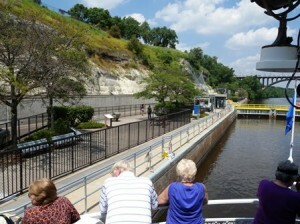 Just how many locks are on the Mississippi River, I wondered as we inched up between the concrete walls. 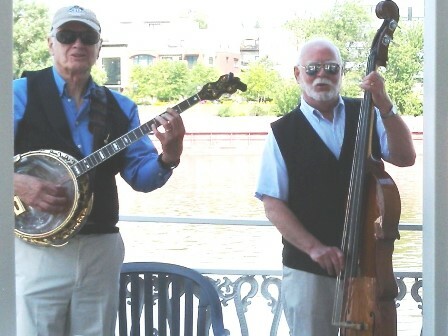 Our story tellers didn’t dispense that fact with a banjo-strum, but I looked it up later myself and the answer is 29; 27 if you start counting with #1. Locks 1 and 2 are in Minnesota; 3-8 in Minnesota-Wisconsin; 9-11 in Wisconsin-Iowa; 12-19 in Iowa-Illinois, and 20-27 in Illinois-Missouri. Lock #27, also known as Chain of Rocks Lock, is at the southern end of Chouteau Island near Saint Louis, Missouri; it is the only lock south of the confluence of the Mississippi and Missouri rivers and the most southern; as such it moves more cargo than any navigational structure on the Mississippi River. Of course even facts have mitigating factors; for instance, tiny Lake Itasca, traditionally accepted as the “source,” is fed by a number of smaller streams. 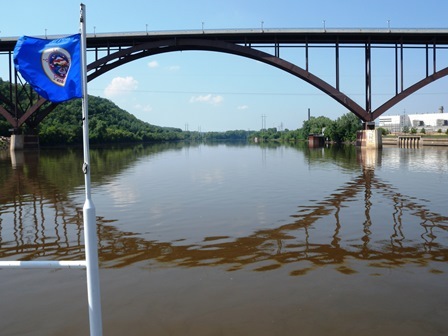 And the dams with the 29 navigational locks aren’t the only controllers of the river’s flow; there are actually 43 dams; fourteen upstream of Minneapolis. There are also thousands of wing dikes along the way that moderate the river’s flow, helping to maintain an open channel and prevent erosion. You should have been there. Really. Walk to the Headwaters of the Mississippi River at Itasca State Park. 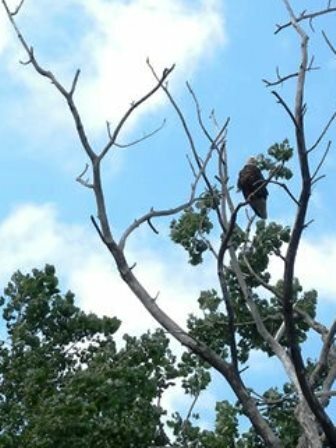 Established in 1891, Itasca is Minnesota’s oldest state park; it totals more than 32,000 acres and includes more than 100 lakes. 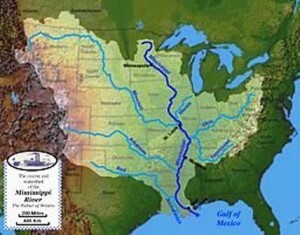 Remnants of the three great habitats of North America may be observed in the park – the Great Plains, the Deciduous Forest of the south, and the Coniferous Forest of the north. 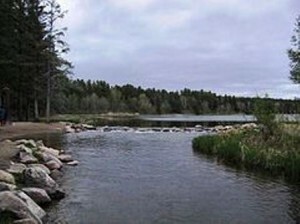 Lake Itasca is also home to the University of Minnesota’s Itasca Biological Station and Laboratories campus, which offers summer courses and field research work year round.